Review:All-In 2 Night by:Lynne Burgess | A Simple Life,really?! Sometimes families need a way to reconnect as a family. 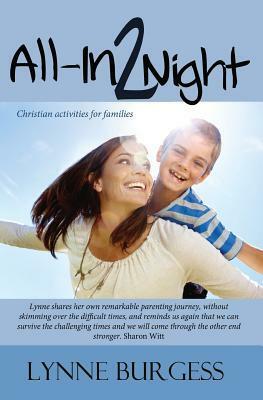 The author of All-In 2 Night explains that this is something she created with her family when the family business, church obligations, and other activities presented a disconnect among her spouse and children that would lead to problems for them all down the road. So as a mother of five grown children she put what has worked for her family in a book to share with others. The idea for an All-In is to pick a topic that the children will have a week to take an implement different activities regarding the topic. And these topics change from week to week including the activities. Everything is scripture based so that the most important detail of our lives is NOT left out or forgotten. I enjoyed the book immensely. Having young children myself, I get so busy taking care of them that making memories and reconnecting with them is usually put on the back burner. The purpose of All-In 2 Night is to basically invest in your family with God’s word and your undivided attention and time. Hopefully, you will build something in them that will last a lifetime. If you would like to purchase the book you can at this link. **Disclosure** This book was sent to me free of charge for my honest review from Bookcrash.